Best wishes to you ! You are the first column my father reads every Saturday - your writing is very accessible and makes us feel even we (aam aadmi) can also partake in the ocean of joy and meaning that is Carnatic music! learn that the song,"Manam kaninde" from the film 'Haridass' is based on 'Ratipatipriya'. It must have been sung by T.R.Mahalingam or by M.K.Tyagaraja Bhagavathar. sung in concerts also y some musicians these days. 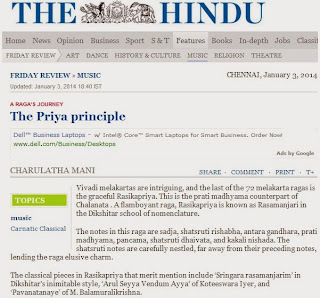 I have gone through the article "Priya Principle" in Hindu dt. 4th inst.You have broadly outlined the intricate techicalities of both the ragas viz Rasikapriya and Ratipatipriya are more informative.The notations furnished for its composing are quite interesting.Besides the same ragas used by the reputed music composers in the film music,broughtout in the article deserves appreciation for their talented rendition. My very best compliments to you.